Well, I woke this morning and felt a bit restless. I started mapping a route from home out toward Steninge Castle, which would take me along another section of the Sverigeleden as I waited for it to warm up. It was 27 F when I woke. Mapping it started making me feel a bit frustrated as it would have been almost 2 hours of cycling JUST to get to some place new. Seeing as I might not be able to start cycling before noon while waiting for it to get at least to 45 F, it was making me crazy to find a shorter way without playing Frogger with traffic. So, when my husband woke up, I asked him if he would drive me to Danmark and he agreed. I got a good man. I’ve only cycled the route twice so it wasn’t so bad. It also helped I was cycling it in the other direction which gives places a whole different look if it’s a spot you’re not familiar with. Oh! 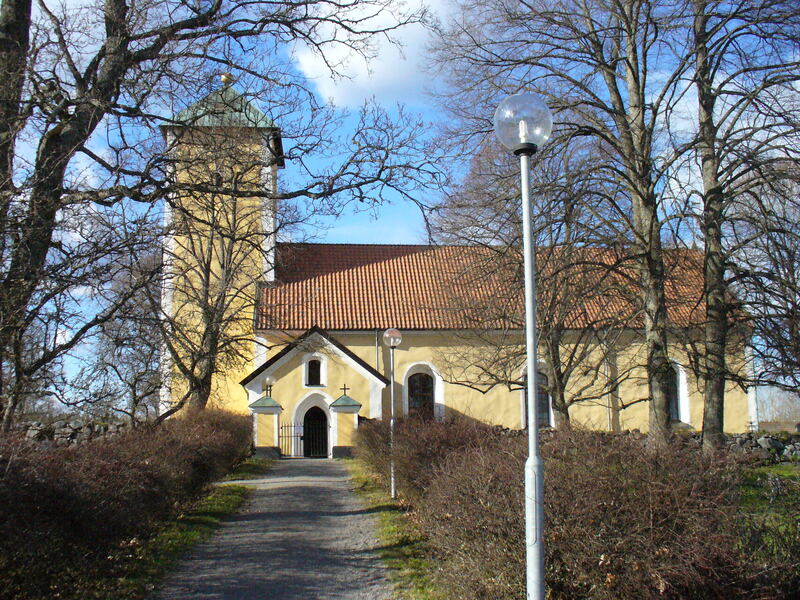 And yes, the picture above is an old one of Danmark Church. It just seemed silly to clutter my 2 gig of space on here with another picture of that church. It felt great to be out even though Loke and I cycled 13+ miles yesterday and Loke was running very well. Though it had been absolutely clear out when we were packing the car, clouds were starting to clutter the sky as I rode out from Danmark. Even so, it felt like one of the warmest days of the year. It was kind of funny with Loke trying to watch the plane as the buzz of the engine kept rising and falling in pitch. I finally had to stick a hand out to keep him from bouncing off my right mud guard. 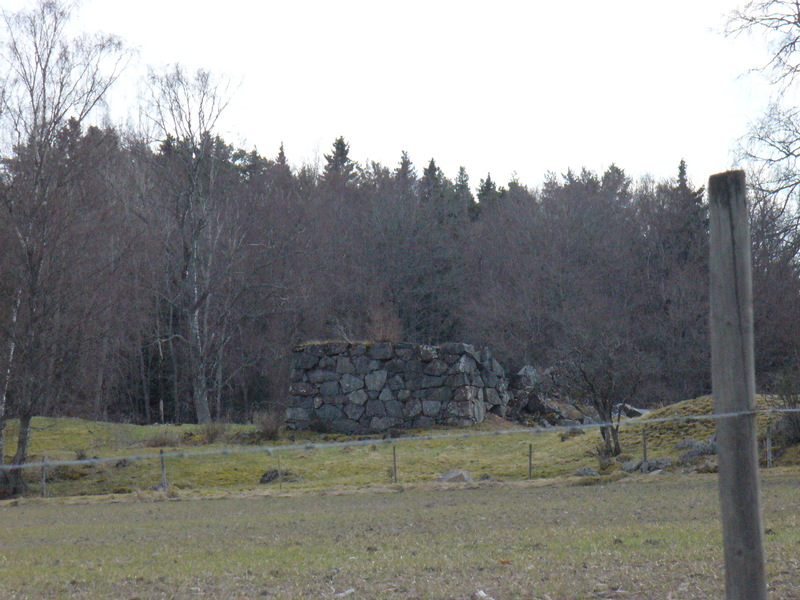 It was an easy trip past Linne’s farm and Fårboden (The Sheep Living Place). It was a long easy coast down to the busier road where the Mora Stones are. It seemed a LOT farther from that turn to the stones. I think it was because it was almost entirely uphill which meant I was creeping along. Loke was actually a bit impatient with it and helped me up the hills. Fortunately, this time there no people with cameras around the Mora stones! I actually pushed myself up those hills a bit since I knew just past the stones would be new ground. I actually cheered (which baffled Loke completely) when I saw the turn off for the Sverigeleden and I went straight past it. I drew a deep breath and felt free. Strange how something as silly as cycling over old ground was making me feel clausterphobic. I think it was all the same to Loke. He’s only been past Danmark and the Mora stenar once and since it was last year, he was still just excited to be somewhere that wasn’t Börje, Gamla Uppsala or Ulva. Once Loke and I got to the new ground, I relaxed a bit more in complete opposition with the furry one’s attitude about the trip. He was all ‘Go! Go! Go!’ while I was humming and glancing around here and there and everywhere. The first thing I spotted was a windmill waaaaay across the field. Good thing there is such a thing as zoom, both optical and digital. It actually took me a bit to get a good photo of the mill as I sat waiting for a cloud shadow to move so I could get a sunny shot. There was a lot of sighing and huffing off to my right side as I sat listening to the birds while waiting for that cloud to move. The things Loke has to put up with. At least it wasn’t the evil blue socks! I really should get a picture of Loke with those on for the giggle factor. There were also quite a few odd random stones scattered around. I couldn’t really tell if there was any significance to them, but their shape and arrangement were not natural. Finally, a couple miles on I found a stone that was significant. My first new rune stone of the year! It was a bit hard to see anything of the inscriptions, but I took the picture of it all the same. As I always try to do now, the translation and whatever other info I could get from the little sign with it are available if you click the photo. Loke also did his grass thrash at the base of it. I tried to get a picture of him twisted all funny on his back, but he’d quit as soon as I’d get the camera turned on. Little stinker. The clouds moved on a bit thicker shortly after I left the rune stone. It made things a bit cool, which wasn’t a bad thing since Loke had actually started panting rather heavily. He was actually thirsty when I stopped to pull my wind breaker on. Less than 5 miles and he actually drank the water I offered him. Generally he doesn’t start drinking until around mile 8. Our already pokey sort of pace was further slowed as there seemed to be a lot of uphill. There was some down, but it didn’t feel like there was as much of it. It took us a while to go the 7 km from the rune stone to Östuna kyrka. It looks a bit like Börje though not quite so large. It had a nice smooth parking lot with a large tree in the center of it, so I stopped the trike there to see if I could find some runestones. All I did was walk around the edge of the wall since I didn’t want to take Loke into the church yard. He had a huge, heaping batch of leftovers the night before and hadn’t gone to the bathroom much. I didn’t want to risk him leaving a pile between the graves. The only rune stones I found were fragments imbedded in the wall of the church itself near the ground. Around Östuna church, I had to change printed map pages. I discovered to my dismay, that parts of two pages hadn’t printed correctly and I was missing a few miles. I decided I wasn’t really worried since I had my map book AND my nifty new Garmin. So, I went on, dodging potholes. That actually annoyed Loke a bit since it means I’m either jerking him to the left, shoving him rather rudely to the right or worse, slowing way down. Once he saw the water, the last thing he wanted to do was slow down. I whipped around the left turn and went on my way past pretty fields with more glimpses of the lake sparkling through the trees. I was chewing my way up a long hill and keeping an eye on my Garmin and what I could see of the maps I printed and discovered I was going the wrong way. It was a bit more of an annoyance factor for Loke as I stopped and spent about 5 minutes trying to figure out what I needed to do to get back on course. I managed to get turned around without getting off the trike and dragging it to go zipping back down the hill I’d struggled up. I found the road I needed not far down the slope, but hesitated. There was a sign essentially saying ‘No unauthorized cars here!’. Well, I figured I wasn’t a car, so down the dirt road I went. It wasn’t the best road I’ve ever been on though it was a long way from the worst. It was mostly free of stones at least though there were little potholes scattered all over it. Most of them seemed to be perfectly arranged so there was no avoiding them all. It definitely kept my speed down. I found the CUTEST house for sale while I was rattling along through the potholes! It sat right on the lake shore. An adorable 2 story swedish style house in bright yellow with white trim. Not my favorite color, but I could over look it for the gorgeous lake view, the storage space, beautiful surroundings and given the size of the house, an extra room for a study for Jens. I didn’t really give it serious consideration for purchase. Given it was a lake front house, I was sure it’s price would have been well out of what we’d be willing to pay for living expenses. My husband and I are not the sorts to live at the edge (or beyond) of our means. As a matter of fact, less than a quarter mile from the house for sale, I found one of those exceptions. The buildings look like they’re only one story, but beautifully built and were obviously quite lavish for the area. Sadly, I have no idea about any of their history. I also liked the little mortar canons sitting on the lawn. There were also a few old barns nearby and the like. Definitely gave some feeling of history, though I couldn’t find anything online. It was around here that again I got lost. Part of the problem is that I haven’t figured out how (or even if I can) set my map display on my Garmin so that north is aways up toward the top of the screen. Still, between it and my memory of what my printed maps were supposed to look like, I figured it out after just 100 yards or so and turned back around to take another turn. The dirt road down the new turn was a definite improvement. Everything I could wish an unpaved road would be. It was smooth, well packed and very few stones. Loke seemed to love it as well. He was suddenly racing with me down the hills and throwing his weight into the harness going up. I was welcoming it. My right knee was bothering as well as the shoes killing my feet. It was also nice to see Loke with so much energy after more than 10 miles. I was also starving. I’d only had a glass of milk for breakfast before I left since eating too much before exercise has been making me feel crappy. Unfortunately, I AGAIN lost track of where I needed to turn because of the skewed maps. 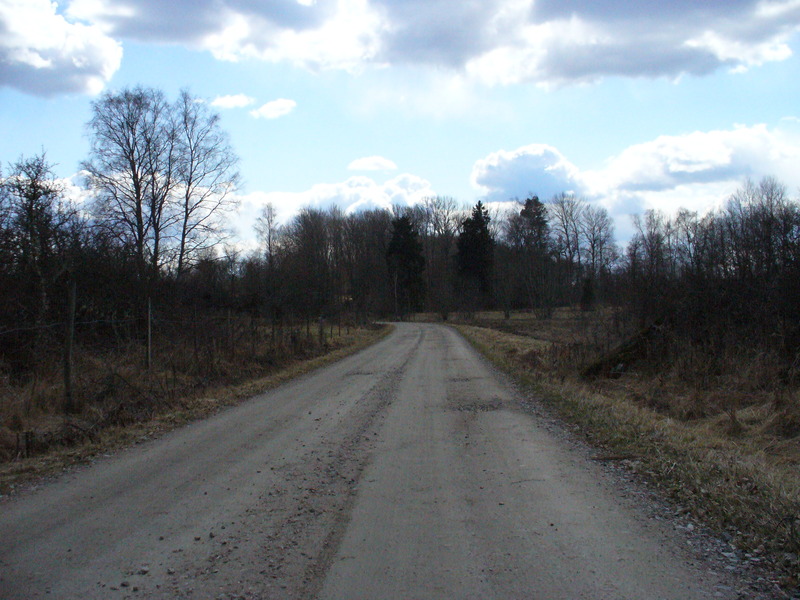 I came off the dirt road and took the turn toward Knivsta and after a short distance, I realised I was going back toward where I had first turned onto the dirt roads to start with. Again, Loke had to suffer while I figured out where I needed to go. I think it was worth it. There were quite a few old farmstead buildings one of them quite unusual looking. Also there were three ruins! Nothing hugely impressive, but they still fascinated me all the same. One was just a small square wall of foundation stones for a house or small buildings. Another looked almost like it might have been a tower as it was some 10 feet tall wall like pile of stones with the same foot print as the other one. The last was a a wooden farm house that had partially collapsed in on itself. I’m only guessing it was a house since barns don’t tend to have chimneys. 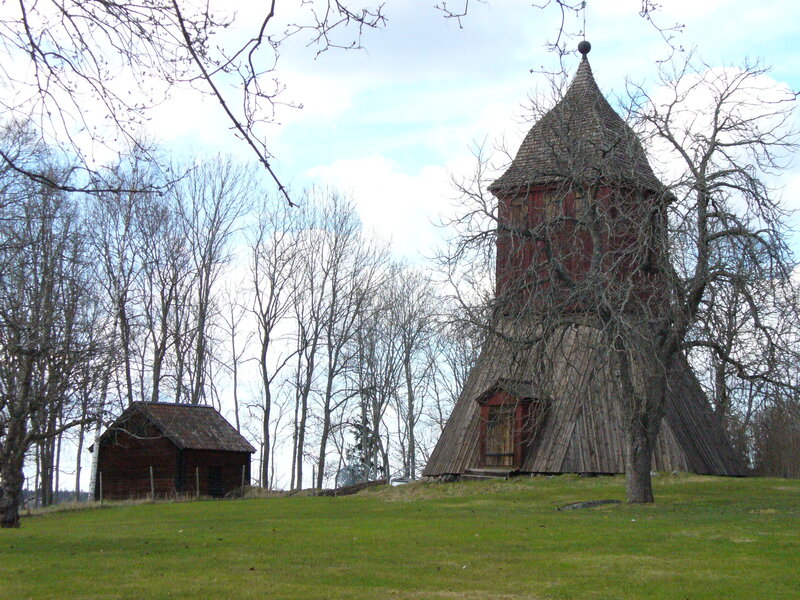 It felt like the whole rest of the way to Knivsta church was either up or down. I mostly kept my trike in first gear. Creep up a hill, zip down the other side with Loke charging along beside me with his tongue lolling in a doggie smile before creeping up the next. He was still throwing his weight against his harness up every hill too. My husband often tells me how impressed he is by the distance I cover. I often reply that he should be more impressed with Loke. I often coast down hills if I have Loke with me. The fuzzy one has to keep those legs moving for every foot we cover. It was coming up on 4 pm when I came to Knivsta church. It’s a pretty little church and there was actually a little open air museum that had a collection of a few farm buildings. The bell tower wasn’t too far from the church, laying just behind what I’m guessing is the vicarage. By this time, Loke and I were tired though we hadn’t even covered 20 miles yet. I think for me it was the lack of food for the duration of the ride as well as the fact we cycled the day before and I’m not used to that yet. Loke seemed to be losing a bit of his steam as well which wasn’t surprising given how much help he’d been on all those hills. I’d pretty much decided that Loke and I wouldn’t be making to the castle I’d planned to end the ride at for a total distance of around 25 miles. It was still almost another 5 miles to Odensala which I was DETERMINED to get to and then another 7 miles or so to the castle after that. I didn’t feel terribly disappointed by the decision. It had been a good ride with lots of new things to take pictures of, nice day with not a drop of rain, and beautiful scenery! What was there to feel bad about? With Loke starting to drag and my knee bothering me more and more, we went on our way for the final push to Odensala. Loke barely even sped up down the slight slope from Knivsta church. There was a LOT of uphill toward Odensala. My knee didn’t like that at all. I also discovered something I really disliked and it will mean that if I ever cycle that stretch of road again, I will NOT have Loke with me. There were quite a few dogs along the way. The first one was a huge shaggy black thing. Granted, it was fenced, but it was quite a flimsy looking one and not very high. That dog could easily have gotten over it if he’d chosen to. He wasn’t barking either. Just staring and drooling as every couple yards we’d go, he’d do a mock charge like a bear. The second was immediately after him and it was a small loud dog. His fence looked like he could wiggle right through. Fortunately. Both of them stayed put. It was the third one that got my heart going a bit. I was passing by a corral where a woman was working with a cute little draft sort of horse. The kind with a dun body and cream on the belly and insides of the legs. I cringed when I saw she had a pair of dogs frolicing in the paddock with her. Fortunately, she spotted me and moved all the animals back out of my sight. Unfortunately, the Saint Bernard wasn’t hers. He came charging from a house and stopped with just a small ditch between me and Loke and the slobbering brute. I made it past that point to a privacy style fence, but had no relief as the other end of it was open. As soon as I realized that, I got out of the trike seat (on an uphill slope no less) with far more ease and grace than I ever thought I could. I put myself firmly between Loke and the Bernard. He stopped about 10 feet away and just barked and snapped. Loke, THANKFULLY, just stood there, not even trying to look around my legs. After about a minute, his owner came down and pulled him away. Fortunately, after the Bernard, there were no more incidents. It was just a pleasant jaunt the rest of the way to Odensala. I was glad to see the church. I called my husband to come get us, parked the trike and proceeded to change to my comfy sneakers from the torture devices that are my cycle shoes. I also took the harness off Loke. As I stretched out on a handy bench, Loke flopped down next to me and we both kinda dozed until Jens came. Flat dog and I feel recharged. A very good day. I think I might have to rest tomorrow though and Loke’s feet definitely need a day or two to recover.